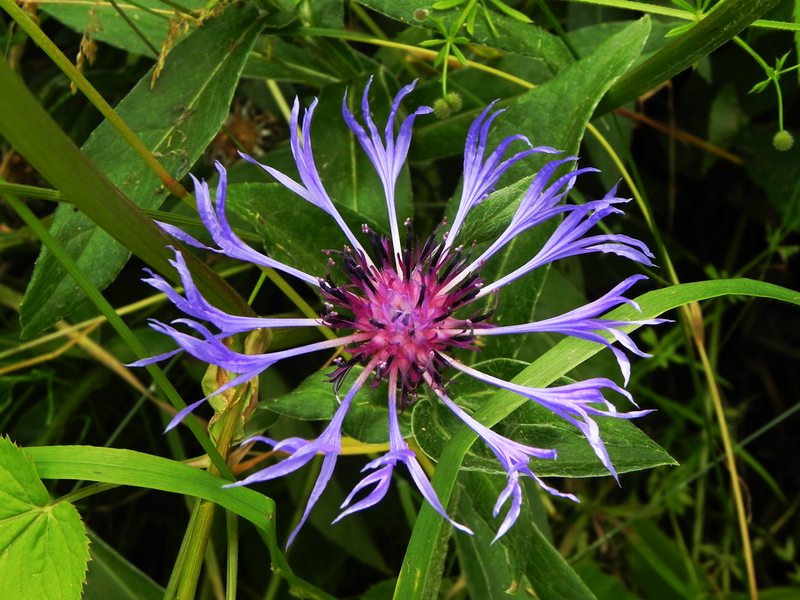 This is a Cornflower, there’s not a lot of them about. They used to be called Hurtsickle because they blunted the reapers scythes. They’re inedible too, so they became Agricultural Enemy Number One. They couldn’t stand up against the wrath of the herbicide companies and so now they have almost disappeared. Certainly this one is on the opposite side of the road to the field that it probably once lived in. Being such a striking colour, it has been adopted by almost everyone at some time or other. Political parties of all shades and in many countries have claimed it as a representative of their dogma. It has been the favourite flower of individuals as diverse as Pharaoh Tutankhamun, Kaiser Wilhelm I and John F. Kennedy, and it is used by First World War veterans in France to commemorate Armistice Day, in the way that the Poppy is used in Britain. It’s Latin name associates it with Chiron, the Centaur who dared to be different. Centaurs, generally, were a riotous bunch. Wine women and song was the way they wanted it and they didn’t mind trampling on any human stupid enough to come between them and their lifestyle choice. Chiron didn’t do orgies and all that, he stayed home in his cave and taught a string of Greek Gods and heroes about medicine and how to be a real human etc. Oh, and the chemical that gives the Cornflower its vibrant blue colour is the same chemical that makes red Roses red.